Golf has been here in Marrakech since the 1920s. For many years, the only course to play was the classic Royal Marrakech. Famous statesmen like England’s Winston Churchill and American President Dwight Eisenhower walked the fairways. Times are changing, even in timeless Marrakech. Marrakech is now a golf destination with eight nearby golf courses and direct flights from around Europe. These eight golf courses in and around Marrakech are within a half hour from the Medina, the city’s medieval center. Green fees for the golf courses around Marrakech, run from about 55 to 80 Euros and up, depending on what part of the season you play. There will be an added fee for the mandatory caddy. On most courses caddies are mandatory. Their abilities and language skills vary. Yet, fees are low compared to renting a golf cart and caddy fees often support a Moroccan family. influences from old North Africa. A nine-hole course, called Menara, also is part of the club. Royal Marrakech is not long at 5,888 meters. Royal Marrakech is mature with 15,000 trees growing on the course. 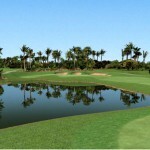 Each hole has an identity of its own with an exotic feeling complete with the sounds of a tropical forest. 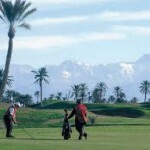 AMELKIS GOLF CLUB, with its wonderful views of the Atlas Mountains, is a modern golf course for Morocco’s tourists. Designed by the American golf designer, Cabell B. Robinson, this 27 hole course opened in 1995. The wide fairways has century-old trees and giant papyrus reeds. Off line shots will find one of the many challenging bunkers placed around the course. Water hazards dominate the back nine like the 447 meter 15th hole, for example. Amelkis is a challenge for golfers of all levels. 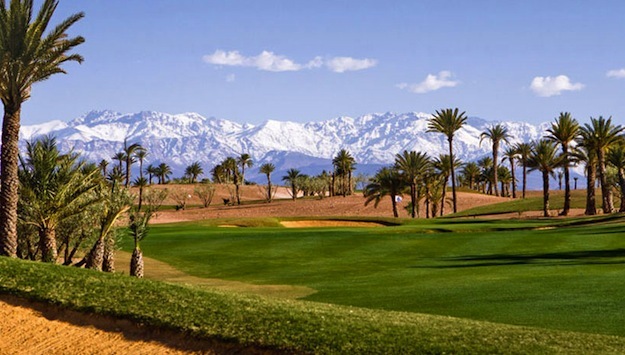 With its backdrop of the Atlas Mountains, ATLAS GOLF MARRAKECH is a charming and well maintained golf course. 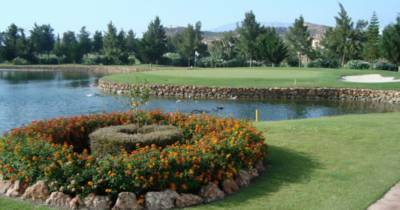 The nine hole par 32 is the perfect choice for golfers who want to enjoy other Moroccan attractions during the day. Atlas Golf offers an excellent French-inspired restaurant and bar in a tranquil setting. There is a delightful spa facility with both outdoor and indoor pools and a hammam, a steam room considered to be a Morrocan staple. Right next door is the “kids club” where you can reserve supervised fun for children. There is the resort’s planetarium that allows you to view the galaxy during clear Moroccan evenings. AL MAADEN is one of the newer courses in the Marrakech area. Al Maaden is also the name of the resort that surrounds the golf course. Designed by Kyle Phillips, at more than 6,500 meters from the member’s tees, the course is a real challenge to all. You will enjoy a classic Moroccan garden due to the resort’s central irrigation system. It also means water comes into play on several holes. The par 3s, as designed, are definitely interesting golf holes, especially for low handicappers. Golfers predisposed to hydrophobia could be in for an interesting round. As you would expect, the club house at Al Maaden has a terrace with splendid views of the Atlas Mountains. The excellent service at Al Maaden allows you to recall your golfing experience in complete serenity. 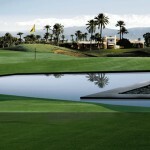 Designed by the Jack Nicklaus Design team, SAMANAH is another Marrakech contemporary golf course. It is an 18 hole championship course playing at over 6800 meters. It’s a real “desert-course,” utilizing the surrounding arid land. Nicklaus has included water hazards, a waterfall and there are plenty of trees on the site. 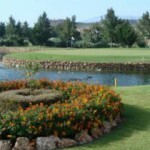 Samanah is a full service golf facility with a 2,000 sq.m clubhouse. It has excellent practice facilities, including the David Leadbetter Academy. It is a challenging treat to play a course designed by Jack Nicklaus, his first in Morocco. The few who have played describe it as “a real championship course”. The former Scottish European Tour professional, Niall Cameron, designed Assoufid. 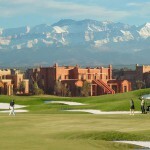 Beautiful, with a background of the Atlas Mountains, the golf course is in superlative condition. Assoufid may well be a future European Tour stop. just over 3000 meters. Both courses contain man-made lakes. The courses at Palmeraie are better maintained now as new management. With a new greens keeper and an equipment upgrade is making its mark on the facility already. L’OASIS DE NORIA is the newest course on the glorious golfing block of Marrakech. Designed by Arthur Hills & Steve Forrest, Noria has three distinct six hole loops of landscape experiences. Garden, Orchard and Dune have the snow-capped Atlas Mountains in the background. Braemar Golf, based in St Andrews, operates Noria. It provides full management services. In golf terms, that stands for quality of the highest order. At 7500 yards off the tips, it can be a tough. If you play off the middle markers, it’s about 6700 yards and far more realistic. A large, traditional “basin” cleaves the 18th hole stretching from the clubhouse to the far side of the site. The course covers a semi-desert location of 75 hectares. and Featuring four lakes and 85 bunkers, the challenges get tougher as the round progresses. In regards to the 9th and the 18th holes, with their square greens and parallel fairways, the jury is still out. Even with no consensus, you can’t deny their fun to play. Noria Golf Club is yet another reason why golfers should be looking to Morocco as a golf destination.